I have been soooo busy making class samples and life in general. Last weekend I was helping Deb Tucker at her booth for the Genesee Valley Quilt Guild in Rochester, NY. 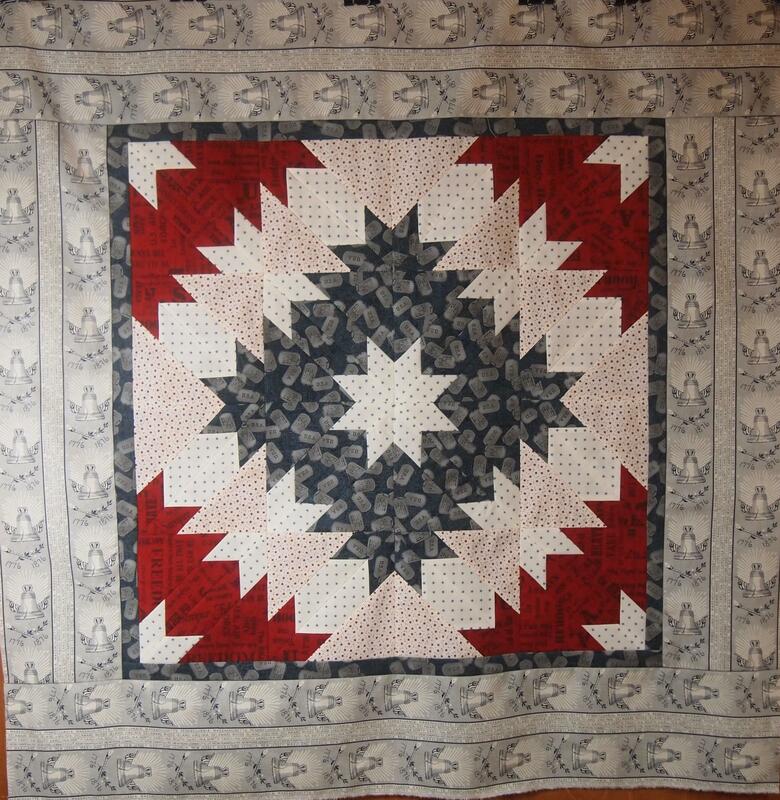 They sure put on a great quilt show, they had over 600 quilts and great vendors. I came home and a few days later taught a beginning Hunter Star class at Sew Wilde in New Hartford, NY. 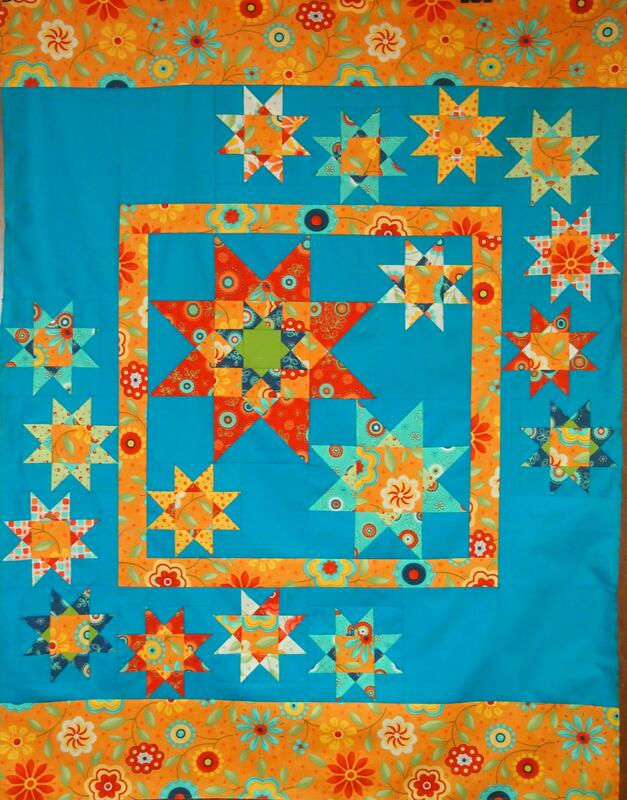 Next week we’re breaking out the Tucker Trimmer I and learning to make Rangeley Stars at Tiger Lily Quilt Company in Utica, NY. This is such a fun and easy star to make. We start with Quarter Square/Hour Glass Units using our Tucker Trimmers. 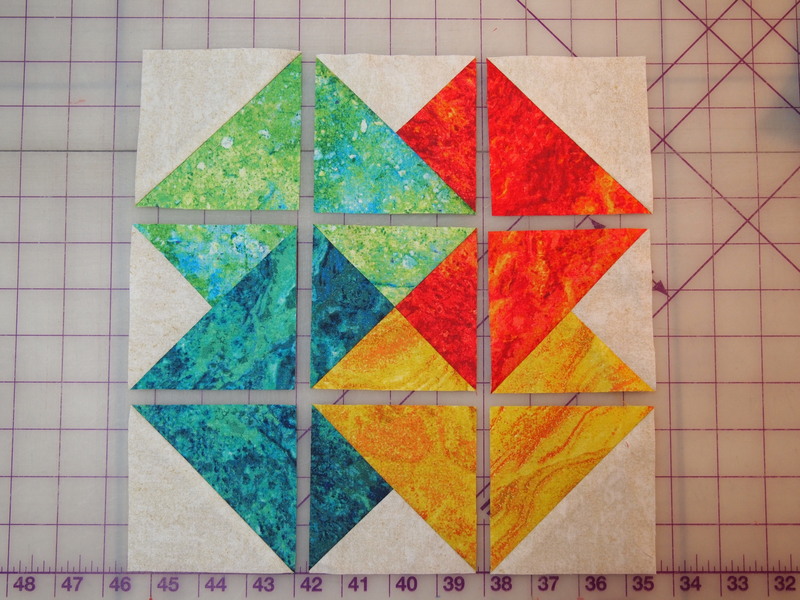 Yesterday I finished Solitaire, a Deb Tucker Quilt that utilizes the Tucker Trimmer also. 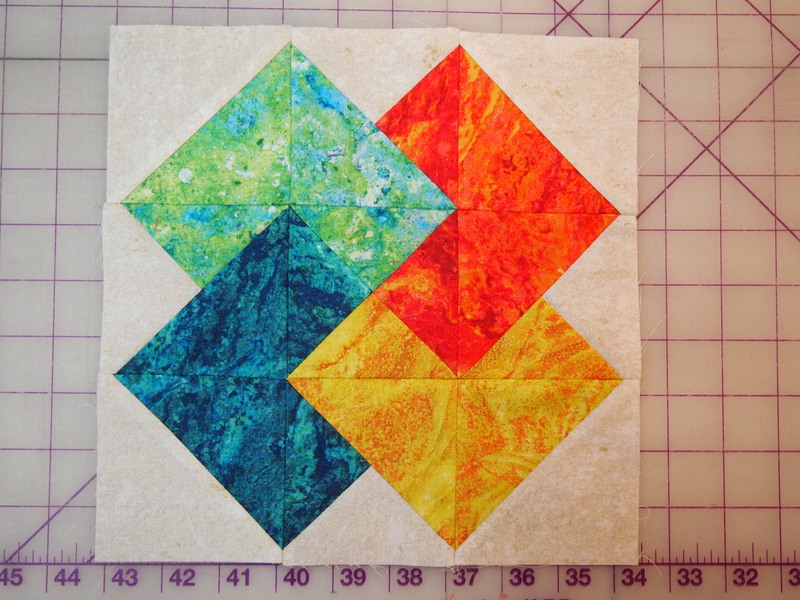 This block is made up of 1 hour glass unit, 4 half square triangles and 4 combination units all made with the Tucker Trimmer I. When the units are sewn together it becomes the card trick block. 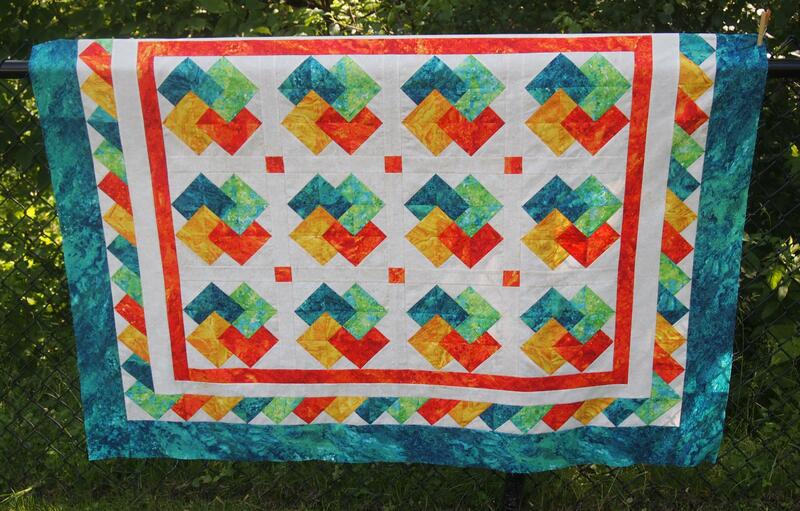 I love the pieced inner border in this quilt. When making the combination units you create a left and a right unit at the same time. One set is used in the blocks, the other in the border. I did have a fabric malfunction. There are supposed to be cornerstones in the outer border but I cut them wrong and decided to finish it without them. The fabric I used was Stonehenge from Northcott Fabrics. It was sunny out so you can’t really see how vibrant the colors are. 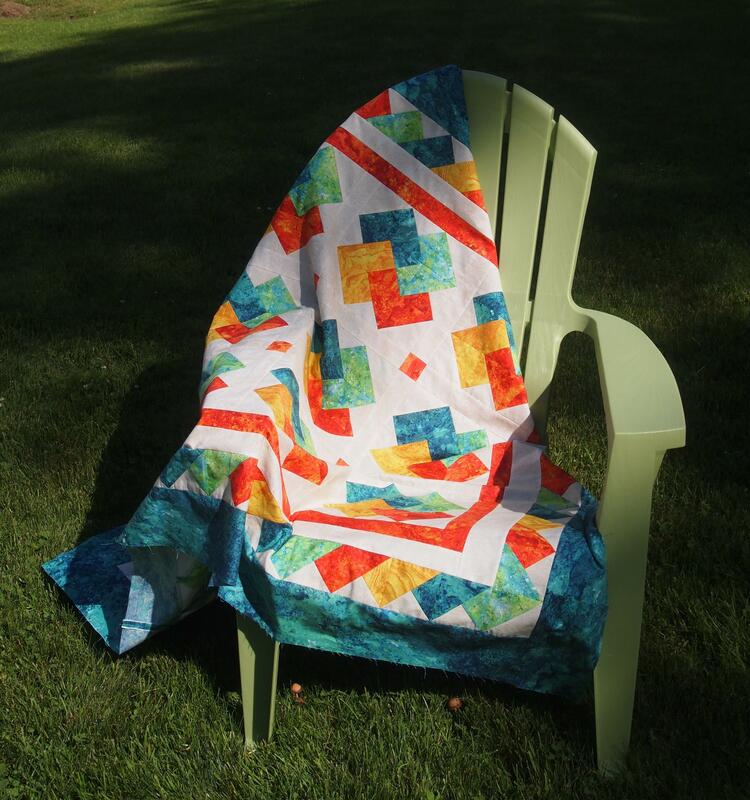 Happy quilting, see you around the fire pit! 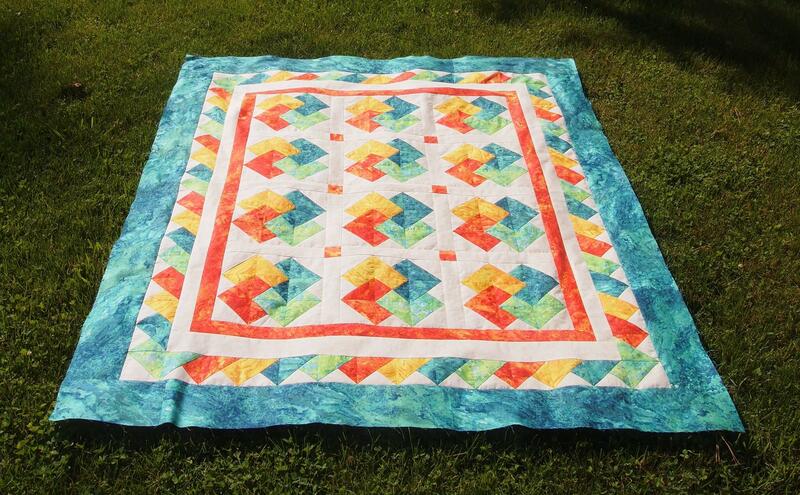 This entry was posted in Hunter Star, Tucker Trimmer Units and tagged Deb Tucker, Hunter Star Tool, quilting, Quilts, Rangeley Star, Solitaire Quilt Pattern, Studio 180 Design, Tucker Trimmer 1 on June 14, 2015 by ifthesethreadscouldtalk. What is a tucker trimmer? A Tucker Trimmer is a 6″ square up and tromp tool made by Deb Tucker for Studio 180 Design. It not only has vertical horizontal lines but diagonal also. If you go to http://www.studio180design.net they have free videos about each tool. The card trick block is one of my favorite traditional blocks. I had fun making it!